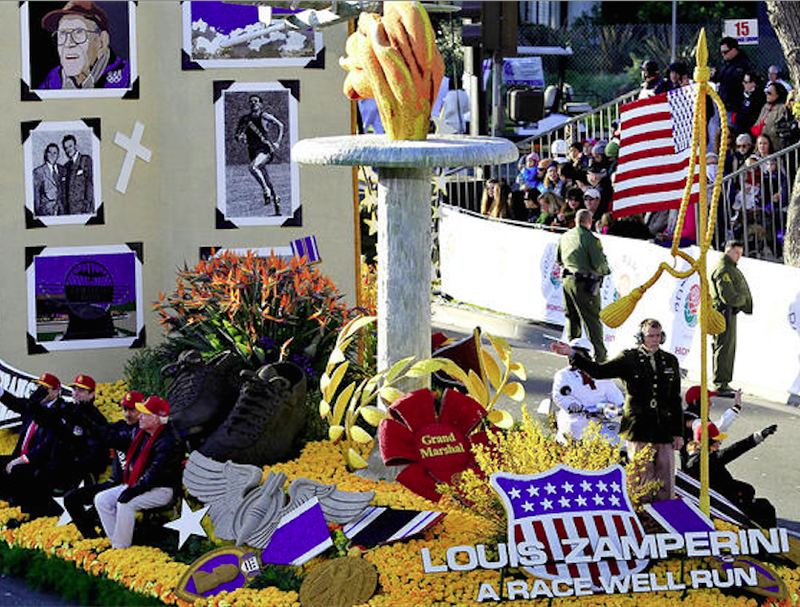 Picture above is the "Louis Zamperini: A Race Well Run" float at the 2015 Rose Parade this morning, sponsored by the City of Torrance - Zamperini's home town. The title of the float signifies both Zamperini's achievement as an Olympic athlete and a passage in the New Testament Scriptures: " ... I have finished the race, I have kept the faith ..." 2 Timothy 4:7. The float also acknowledged what the recent film "Unbroken" left out; what Zamperini said was the most significant event in his life. On the left of the montage of photos is Zamperini with evangelist Billy Graham at the 1949 Los Angeles Billy Graham Crusade, where Zamperini committed his life to Jesus Christ. Zamperini went on to say that this experience, and subsequent life change, enabled him to forgive his former Japanese captors. Incredible story. Zamperini was chosen as the Grand Marshall of this year's parade. He passed away this past July. The Rose Parade choose to honor him posthumously with a riderless horse. Here's a five minute video describing his life as an Olympic athlete, WW2 pilot, POW survivor, returning veteran, and follower of Christ. Hats off to the City of Torrance to sponsoring this float, and for including what Zamperini would say was the most important decision of his life.